Suzanne mentioned in the combox below that Jennifer's Fr. Oak craft idea is a great activity to consider for the upcoming Year for Priests convoked by Pope Benedict XVI beginning on June 19, 2009. I couldn't agree more! But, I know that there are some people who might be put off by the idea of having to create their own stand so I wanted to share with you what I found which was going to be my second option if our Fr. Dowling idea hadn't worked out. 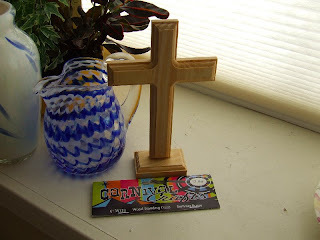 I found this free standing wooden cross at Hobby Lobby in the VBS craft section up at the front. It was in a bag but I saved the label so you could identify it. I'm pretty sure these were on sale but I don't remember specifically but if not, it was only $3. It stands 7 1/2 inches tall and 4 1/2 inches wide and can be sanded and painted to make it smooth. If you don't have a Hobby Lobby, something like this would work too (it's more expensive) or if you want one for each child, you can buy the crosses by the dozen. 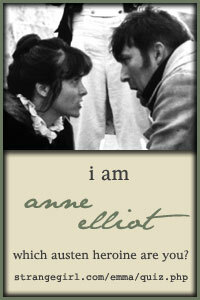 As much as I would love to have satin vestments like Suzanne (shall not covet, shall NOT covet! ), felt is the fastest and easiest way to go. I cut this chausible out in about 2 minutes. Anyway, just wanted to share this idea with anyone who might be in need of a super simple option. I LOVE the cross idea so much better!!!!! I'm going to try this. This is such a great idea. And maybe a prayer to St. John Vianney nearby so we can remember to pray for our priests. 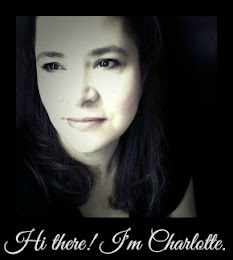 What a beautiful craft idea, Charlotte! This is so unlike you! PS. My word ver. is "dising". Ha! Ah, now this I can do. :) Thanks! I've had such a great time today watching all the many posts come through on the 4real boards about Fathers Ash..and others, so now Father Forest. What a hoot you ladies have been, make my day! I love both your crafty ideas and passing them along to my daughters for their children, my grandbabes. Thanks Charlotte! As always, what a blessing you are to all of us. 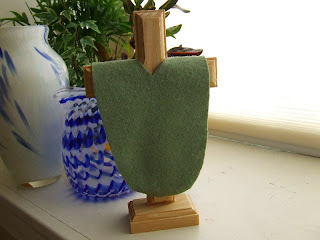 Beautiful and I'm going with a cross too :) Your felt vestments are very soft and lovely! Thanks for sharing this! I've found the simplier the better for me. If it isn't simple, I with all my good intentions, just don't do it. And Thank you Opey124 for sending me here!